MyCaptcha1 is a CAPTCHA implementation for Drupal 5.x. A CAPTCHA is a test that tries to determine whether a user is human (learn more). The combination of MyCaptcha and Form Store enables you to add captchas to arbitrary forms2 on your site without modifying a single line of code. 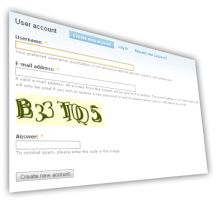 While MyCaptcha provides much of the same functionality, it is not related to the Captcha and TextImage modules by Fabiano Sant'Ana that can be downloaded from Drupal.org. 2Due to the way the Drupal login form has been coded, it cannot be protected by MyCaptcha. Update: MyCaptcha is no longer supported.